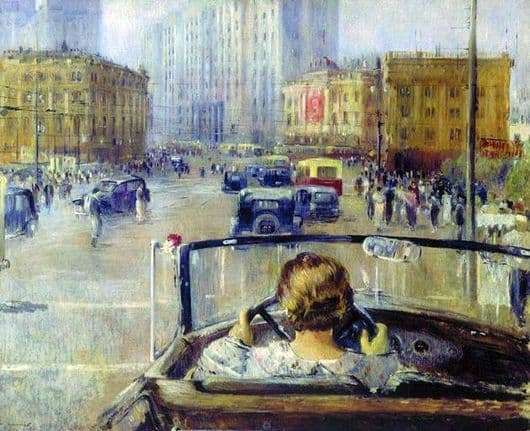 Soviet artist Yuri Ivanovich Pimenov wrote “New Moscow” in 1937. It is created in the style of classic realism. The picture echoes his work “Front Road”, which depicts a similar composition, but with a different background and characters. The canvas itself is called the continuation of a series of works on the Moscow theme. We see the exposition of Sverdlov Square, located not far from the city center, the blurred silhouettes of the majestic Hotel Moscow and the House of the Unions appear before our eyes. In the foreground is the driver’s cab of an open cabriolet, which is operated by a blond, short-haired woman in a blue dress. There is a wide road ahead, on which a lot of other cars are driving around. Crowds of inhabitants pass through the alleys, depicted in the form of fuzzy shadows far ahead. Such a panorama is very unusual for Soviet creativity, the author seems to depict a photographic image. Like a canvas, written in the thirties of the twentieth century, it, perhaps, can be considered revolutionary. The whole environment is shown by the artist easily, vividly and even airy used translucent shades of blue and brown. This combination of warm and cold tones brings a strong harmony to the work. Masterfully depicts the road on which the cars are moving. It attracts attention with its absolute purity and even mirror brilliance. It seems to reflect everything that happens on it, rewriting the form in faceless shadows. The general view is very noble, people are skillfully registered, we can even look at the vague details of their clothes, catch light movements when walking. Characters of the picture, except for the main character, do not seem to be real. They are exposed in ghostly silhouettes and this gives the picture some mystique and timelessness.